Sean Dyche insists the imminent decision he will have to make over his number one isn’t one of the toughest he’s had to make. Club captain Tom Heaton - Dyche’s first permanent signing for the club five years ago - is back in contention for a place in the squad after six months out following a dislocated shoulder. In that time, Nick Pope has taken his opportunity in style, becoming statistically one of the best performing goalkeepers in the Premier League this season, and earning a place in the England squad. Heaton, who has three England caps to his name, is fit and raring to go again, but as the saying goes, possession is nine-tenths of the law, and it is Pope’s jersey to lose at present. 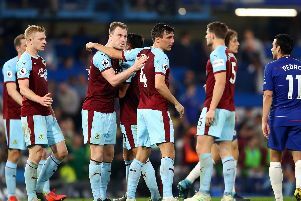 But Dyche feels the goalkeepers’ union know the state of play - they only have one shirt to play for, and there will always be a disappointed party. Asked whether choosing a keeper is one of the toughest decisions he’s had to make, he said: “No, not at the moment. “All goalkeepers understand the way goalkeeping works. “The one who’s got the shirt is usually, not always, the most powerful keeper. “Not by his performances, just by the fact that he’s got the shirt. So it’s Pope’s shirt to lose? : “No, not really. I know you’re looking for a line. It’s not his to lose. “It’s for him to keep playing well and enjoying what he’s doing. “That’s the same for all the goalkeepers here. It’s up to them to demand from themselves and to get the chance to go and play, however that comes around. “Because don’t forget it came around by injury for Popey, not by a lack of form, just by injury. It can come round in many different ways. It’s just the rule of being a goalkeeper that only one can play.